There are around 18 locations that have the place-name element ‘castle’ attached to them, of these there is only Castle Drogo, Gidleigh Castle, Lydford Castle and Okehampton Castle that come close to resembling a fortified structure of the historic age. True there are several Iron Age hillforts that are called castles and are indeed fortified but these cannot be classified as ‘true’ castles. Out of the remaining four structures, Castle Drogo was built in the early 1900s, Lydford Castle could be classified as a prison and Gidleigh Castle was a 14th century fortified manor house. That then leaves Okehampton Castle which can conjure up images of chivalrous knights, damsels in distress and other such romantic notions. This stronghold is certainly the largest castle on Dartmoor and some will say that it’s the largest in the South West. ‘The pleasing though pensive thoughts, which occupy the mind on visiting the scenes of ancient grandeur, are here rendered peculiarly so, from the gloomy situation of these Ruins, situated in a valley, confined on each side by steep hills, and watered by a rapid stream. These remains are extremely scattered, the South side is most connected and perfect, rising above some rich shrubs, pleasingly contrasted, on the opposite side, by a hanging-wood, and between these a flat intervenes, of excellent pasture. On a lofty mount a large tower, belonging to the keep, is yet standing, but one half of it appears on the verge of falling‘, (1807, p.40). ‘Viewed from aloft the ground plan of the castle might be distinctly traced, and it needed no great knowledge to follow the architectural design of it. The sockets of the pillars that sprang to a groined entrance still remained, and within, to right and left of the courtyard, there towered the roofless walls of a state chamber or banqueting hall, on the one hand a chapel, oratory and guard-room on the other. The chapel had a piscina in the southern wall; the main hall was remarkable for its mighty chimney. Without, the ruins of the kitchens were revealed, and they embraced an oven large enough to bake bread for a village. Round about there gaped the foundations of other apartments, and opened deep eyelet windows in the thickness of the walls. The mass was so linked up and knit together that of old it must have presented one great congeries of chambers fortified by a circlet of masonry; but now the keep towered on a separate hillock to the south-west of the ruin, and stood alone. It faced foursquare, dominated the valley, and presented a front impregnable to all approach… Far below bright Okement loops the mount with a brown girdle of foaming waters that threads the meadows; and beyond, now dark, now wanly streaked with sunshine, ascends Dartmoor to her border heights of Yes Topr and High Willhayes. Westerly the land climbs again and the last fires of autumn flicker over a forest.’, (Phillpotts, 1930, pp 65 -67). ‘Baldwin holds Okehampton himself from the King; (his) castle is sited there. Osferth held this manor before 1066. It paid tax for 3 virgates of land and 1 furlong. Land for 30 ploughs. In lordship 4 ploughs; 18 slaves; 1 virgate and 1 furlong. 21 villagers and 11 smallholders with 20 ploughs and 2 virgates, 6 pigmen. A mill which pays 6s 8d; meadow, 5 acres of pasture 1 league wide. 4 burgesses; a market which pays 4s. 1 cob; 52 cattle; 80 sheep. Value of the whole £10; when he acquired it £8, (Morris, 1985, p.105d). It has been suggested that in common with other Norman castles Okehampton was sited at an interface between differing landscape types. In this case there is the upland zone of the moor which was used for pastoral and hunting activities and the lower crop growing lands of the moorland margins, (Creighton, 2002, p.510). So, what of the castle? Above are a couple of descriptions of what earlier visitors saw and here is now a description of what I saw on my visit during April 2008. Whenever visiting any site I always like to read up about it first, that way you don’t miss anything, especially the less obvious features. The problem I find with most castles is that they have usually undergone several phases of construction and therefore present a confusing jumble of walls and rooms. Okehampton Castle did appear to be fairly straightforward with only four phases of development that made for a logical plan. It was a cold, crisp morning when I called which coincided with the Easter holidays which meant it was fairly busy . There is an excellent guide book on sale at the kiosk that will lead you through the various rooms of the castle complex in an anticlockwise order. But, just to be awkward, I like to start at the oldest part and then move forward in time which in this case meant going straight to the keep at the far end of the site. As you walk up through the castle you are presented with what must be one of the more famous of Dartmoor icons, the huge mound or motte with the ruins perched on top. It amazes me how the precariously, teetering stack of the keep wall manages to stay upright, especially when you consider the harsh moorland storms it has to endure. If you do an image search for ‘Okehampton Castle’ you will find that over half of them are of the motte and keep and the photograph below is no exception. When looking at the motte and keep it’s important to ignore all the stonework which lies at the base, this was a later phase of the castle’s development. So, having blotted that out, imagine two things, what the inhabitants of Okehampton must have thought when the structure first appeared in their local landscape? And secondly, what it must have been like to have to trudge up and down this great mound, especially with buckets of water? Today one can get to the top via a fairly gentle meandering path but even this leaves one in need of a cigarette when reaching the summit. The motte was built sometime towards the end of the 11th century, Higham (1999, p.21) suggests that it was built some time after the spring of 1068. The mound was constructed with natural shale quarried from around the base which then left a ditch running around the western and eastern sides. Estimates suggest that on the western side the ditch was about 13ft deep which from its bottom left the summit towering some 80ft above. Endacott, (2003, p.9) considers that originally there would have been a wooden bridge which spanned the ditch and allowed access to the motte. Excavations have determined that the foundations for the keep were laid down at the same time as the top layers of the motte were being completed. It has been assumed that in keeping with other Norman castles, Okehampton keep consisted of three levels, the ground floor, first floor and roof parapet. As there is no evidence of an entrance on the ground floor it is though access would have been gained via a flight of wooden steps leading into the first floor. It appears that it is only on the front where the original stonework remains, the rest is the result of later 14th century development. From inside the keep one can appreciate the struggle that the remains of the stairwell and turret have to remain upright. There is nothing spectacular in this room apart from the entrance to the garderobe in the south west wall. For some strange reason people are always fascinated by the garderobe, this is understandable with kids but adults? Originally the garderobe was a small room which was used for keeping valuable clothes and possessions safe, hence the name garder (to guard) robe (clothes). It was only in later years that the name represented a kind of modern-day en-suite which included a privy. For those with a fascination of such things, it is thought at Okehampton that there is a possibility that the privy chute spilled its contents onto the motte. This meant that some poor soul had the pleasurable task of cleaning both it and its landing pad below, incidentally these individuals became known as ‘gong farmers’. Amazing how little changes, how many of us are still clearing up our bosses mess? Now, I have this fascination for masons marks and so often intently study the walls of ancient buildings and whilst doing so at Okehampton it soon became clear that many of the walls are covered with old graffiti, again, nothing changes. Just inside the doorway of the keep are numerous examples of ‘killroys’ from the 1800s as can be seen from the photograph. This probably is a good time to explain my attempt at a virtual tour of Okehampton Castle. Sadly I cannot figure out how to get video clips into this website without them taking a month to download. Therefore if you click on each square in the plan below it will transport you to a new page showing photographs of the relevant features in each room. Click on the green squares above to see photographs of each room and its features. The timeline tour now goes slightly astray because to save having to go back down to the precinct and then come back up to the motte it is easier to jump forward a few hundred years and step from the original keep through to the 14th century extension. It is thought that the ground floor was used either as a storeroom or as servant’s quarters. Either way it was to be basic, here on the ground floor the windows are small, plain and would have been unglazed. This could have been for two reasons, either the small windows meant it would be harder to attack or it was deemed unnecessary to waste money on a storeroom or servants quarters. The end wall clearly demonstrates that people of note were living on the second floor, here the windows are much larger, more decorative and would have been glazed. The room would have been much brighter due to the large windows and would have afforded views over the deer park and the fireplace would have made it much warmer than below. In the far left-hand corner is a garderobe which again would have added to the luxury of the room. It is impossible to say whether this layout would have been reflected in another room on this level or if the rooms were simply separated by a wooden screen. Endacott (p.14) suggests this upper floor would have provided accommodation for the lord and his wife or lodgings for any influential guests. Several times I have banged on about how much this castle was a statement of power and was intended to dominate the local landscape. Every time someone in Okehampton looked up they would have seen this huge, man-made foreign intrusion on the skyline which served to remind them that they were no under Norman control. As can be seen from the photograph below, even today it commands a good view of the modern town. There can be no question that this Norman motte and keep would have caused any attacker considerable problems insomuch as a direct assault would have been difficult. However, if they were of a patient persuasion and were prepared to lay siege to the castle then those inside would have had some serious problems. There would have been no water supply, no kitchens and if they were relying on divine inspiration, no chapel to boost their spiritual courage. This suggests two things, firstly there possibly was no imminent threat of attack and so such defences weren’t needed, and/or the castle was only intended as an administrative centre. But, here is a thought, in the very same Domesday Book that records the castle there is an entry for Lydford which lies about 7 miles away to the south west. This states: ‘40 houses destroyed since the King has come to England‘, (Morris, p.100b). When this type of entry appears in Domesday it usually means one thing, ‘the peasants were revolting’ and to teach them a lesson their houses were laid to waste. So if this event happened, ‘since the King has come to England‘ that means it occurred between 1066 and 1086 when the Domesday Book was written. Okehampton castle motte was built around 1068 which means around the same time the Saxons were rebelling 7 miles down the road at Lydford. In which case why was there no provision for a prolonged attack by angry locals? Now its time to go back along the timeline and off the motte to the 12th century when the second phase of development took place. Sadly, there is no visible evidence of this stage as it is all under later buildings and their surfaces. But it would have encompassed the building of a great hall and its associated kitchens and service rooms. Back to reality, just infront of the remains of the dais is a hearth which is thought to have been used to melt lead in when the castle was abandoned in the 1500s. However just by this are the remains of the original open hearth that would have provided both heat and light to the hall. At the opposite end of the hall would have been a wooden screen which separated the hall from the service room or buttery and the kitchens. Entry to the hall would have been via a very ornate doorway in the south eastern wall which led in from the bailey. The buttery was where all the food and drink was prepared and was the domain of the castle steward who over saw all the preparation and food presentation. It was from here that the servants would carry out the sumptuous dishes to lay before their master’s. Interestingly, as Endacott notes (p.7) there would have been no buxom serving wenches to wait on the tables as it was only males who were allowed to wait on the tables – bang goes another salacious image. Above the buttery was the solar, this was the private retiring room of the lord and lady, again there would have been a display of opulence here. There would have been a fireplace, garderobe and three large and ornate windows which again for the local area in the 14th century was very plush. A covered passage would have led from the buttery into the kitchens, in the first kitchen are the remains of a hearth and ash pit along with a drain that was cut through the wall. The second kitchen is slightly larger and contains the remains of two large ovens which had been built into the bottom of the motte. These were built in the next phase of development as was the larder which lies between here and the motte steps. Having looked at how the medieval body was fed it might be as well to see how the medieval soul was sustained and so just opposite the kitchens are the remains of the chapel. The ravages of time and the Dartmoor weather have been a little kinder here because the full extent of the eastern wall still stands. Originally the chapel would have had a sloping lead roof which was crenellated below this the porch allowed entry from the bailey. Inside the chapel would have been decorated with wall paintings, some remains of which can be seen in the right-hand corner of the southern window. Endacott (p.18) suggests that an ornate, wooden screen would have separated the chancel at the eastern end with the altar supported on protruding corbels. The piscina is very well preserved and is embedded in the southern wall, the water from this would have drained through the wall. On the right of the piscina is a time-worn example of Napoleonic graffiti which was the work of a French naval officer called Giles A. Vincent. He was a surgeon on the French Man o’ War called ‘Rejoirie’ which was captured on the 10th of June 1809. 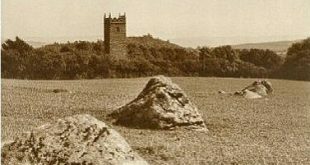 Having been taken prisoner, Vincent was brought to Okehampton where he was given parole, a fact he later recorded on this stone. His inscription reads: ‘HIC V… FUIT CAPTIVUS BELLI’ which Endacott (p.19) translates as, ‘here Vincent was a prisoner of war‘. Next to the chapel was the priest’s lodgings which could be entered either from the chapel or from the western lodgings. During medieval times the priest would have been one of the more important members of the lord’s household and so literally lived on the job to ensure he was always on hand. These quarters would have been small but well appointed with a downstairs garderobe and an upstairs fireplace and window. At the eastern end of the lodgings is evidence of a small, outward protrusion which Endacott tentatively suggests may have contained the castle’s bells which now dictates a slight diversion. Some time between 1291 and 1328 the widow of lord Hugh Courtenay, Lady Eleanor commissioned the founding of two bells. One was inscribed with the words: ‘We were both made to wake Eleanor for to catch game’ and the other: ‘But do by my advice think on Hugh’s soul and so was his name‘, (Endacott, p.29). Both inscriptions suggest that after her husband’s death she still enjoyed the ‘chase’ and that she was concerned for his soul presumably languishing in purgatory. One of these bells, and I am not sure which one, is now housed in the nearby Museum of Dartmoor Life. Next to the chapel are the extensive eastern lodgings, these would have provided accommodation for guests and servants. Originally these rooms would have been on two levels with garderobes on each floor, it is thought that the servants would have lived on the less salubrious lower floor whilst there betters enjoyed the more luxurious top floor. Again it is noticeable the difference in the window sizes of each level, the lower ones being much smaller and plainer. Access to the upper floor would have been from outside via a flight of steps or by a gallery leading around the building from the great hall. Of all these rooms it is those at the northern end that seemed to be the best equipped, again there are garderobes on each level but on the upper floor there is still a hand basin embedded into the wall. It is deemed that the lower floor was used as a storeroom of some kind. On the back of the eastern lodgings was the gatehouse which the led out into the barbican passage and to the barbican itself. This was the business end of the defences for this structure would have been the first place any attackers would fall upon. Evidence of a garderobe suggests that there was an upper chamber above the gate that would have been the guardroom Should anyone ever breach the barbican they would have then been faced with a long passage which led up to the gatehouse. There are traces of a platform running along the inside of the north wall which may have been used as a fighting platform or as a mounting block for horsemen, (Young, 1931, p.35). It is from here that they would have been met with volleys of arrows and other projectiles. Although now filled in, it is presumed that infront pf the gatehouse would have been a deep hole over which laid the drawbridge. The winching gear for this was housed in the upper chamber which also served as accommodation for the castle gatekeeper or constable. There is a small two storied guardroom on the side of the gatehouse which would have served either as the castle stewards office or as extra accommodation. There is also an entrance to the great hall which would have been used by those of a lesser standing when attending manorial courts. The only other feature left for this time period is the postern gate which can be found in the far end of the south eastern wall. This small entrance would have been used to allow small parties of soldiers out of the castle in times of siege, it would also have served as an emergency exit or to discreetly allow visitors to come and go. The next phase of development occurred in the late 1400s, early 1500s and comprised in the building of another series of buildings called the western lodgings. As with previous guest quarters these were well appointed with decorative windows, garderobes and wide ranging views. These quarters actually lie upon the in-filled motte ditch and have in sections been cut into the base of the mound. When looking at today’s surviving ruins there is one thing that is missing, there is no well. Admitted there is a small stream running down the western side and the river Okement flowing to the east. Drawing water from either sources would have proved an arduous task for some poor individual especially when having to slog back up to the castle. But, this problem was overcome by what seems to be a very local method. Creighton (p.54) explains how: ‘rather less frequently we have evidence that castles were supplied with cisterns fed by rainwater or natural groundwater seepage‘ and by this remark he was referring to Okehampton. A similar idea was used at nearby Lydford Castle whereby rainwater was collected from the roof and then piped into the building. Excavations have revealed that at Okehampton there was a building containing a 7ft deep cistern which collected rainwater running off the motte. This was located at the foot of the motte and just to the south of the kitchens. A lead pipe then carried the water off in the direction of the eastern lodgings which is why nobody ever drank it and opted for the ‘healthy’ option of beer and wine, something I do to this very day. This virtually completes the various phases of construction at Okehampton castle because by 1538 the castle was abandoned and left to decay. Local builders soon took advantage of this situation and began robbing the stonework and as mentioned above the lead from the roofs and windows was melted down. A lease of 1642 documents that parts of the castle were used as a bakehouse and it is thought that the ovens for this are those located to the south of the western lodgings. It is interesting to see that the floor of the oven it made from an old millstone which may indicate that it came from a nearby mill, which brings us nicely to the associated ancillary buildings of the castle. The Domesday entry clearly states that in 1086 there was a mill at Okehampton, Young (p.35) suggests that the small brook which runs to the north west of the castle: ‘provided fish ponds and worked the castle mill which was just outside the barbican’. Endacott (p.22) and Higham (p.19) both agree that there is a strong chance of the fishponds being in existence during the 16th century but give little mention of the mill. There is however an engraving dating from 1734 that unmistakeably depicts a mill with two waterwheels as can be seen in the bottom right-hand corner of the illustration below. Also associated with the castle is the adjacent deer park, in fact it is probably one of the main reasons for the castle’s existence. Having just looked at the scroll-bar it will be necessary to do a separate web page for this topic as the park, the Deserted Medieval Village and its feature are a lengthy topic. I also do not intend to explore the history of the castle, there is nothing more boring than listing lines of people, who they married and when they died. If you would like to read more about the families who lived at Okehampton castle then Endicott’s book gives a full history. Suffice it to say, the first owner of the castle was, as mentioned above, Baldwin de Brionne, Sheriff of Devon. None of his sons had any male heirs and so the estate went to his daughter, Adeliza. Eventually Okehampton ended up in the ownership of Hawisia who in 1173 married one Reginald Courtenay. The Courtenay family then through a long line of heirs held the ownership until 1539 when Henry Courtenay got on the wrong side of King Henry VIII who had him beheaded on the 9th of January 1539. Following this event the Courtenay estates were confiscated, the deer park abandoned and the castle left to decay. In the early 1900s a local man called Sydney Simmons acquired the castle site and carried out some repair and restoration work. In 1917 he gave the castle to the Okehampton Castle Trust who held ownership until 1967 was it was placed under the guardianship of the Ministry of Public Buildings and Works. Then followed a huge consolidation project of the ruins which culminated in an archaeological investigation led by Dr. Higham in the 1970s. In 1984 the property came under the auspices of English Heritage where to this day it remains. ‘While popular perceptions of medieval castles are often dominated by their presumed military significance and role in contemporary warfare, the defining feature of the medieval castle was, rather, that it served a number of diverse needs. All castles were built, at least to some degree, to serve as high status private residences and estate centres as well as military strongpoints. As judicial centres and seats of local government, castles were commonly venues of manorial or honorial courts, while many royal strongholds were also armouries, jails and treasuries… The impact of castles on the landscape has been profound. As evocative symbols of lordship, they re-shaped the landscape in the minds of contemporaries.’ (Creighton, 2002, p.1). This certainly would have been so for Okehampton, during the Norman period the inhabitants of the town would have clearly been reminded of whom they served every time they cast and eye to the south west. Here they would have seen the formidable keep perched high upon its pedestal as an icon of rulership and opulence. Undoubtedly during this period the stronghold was a defensive site but also it would have served as the administrative centre for the estate. The Domesday Book records the fact that there was a market which in all likelihood would have been held just outside the castle walls. During this period of history there was great rivalry between towns to establish the most prosperous market quite simply because the busier the trade the more profit the lord made. In the case of Okehampton the challenge came from nearby Lydford who were granted permission to hold a market in 1195 which would have been in direct competition. However, population figures of the time show that Okehampton managed to stave off this competition which eventually lead to a dramatic decline in Lydford’s prosperity. By 1221 ‘Robert de Curtenay‘ had been granted permission by Henry III to hold a fair as well, both would have provided a good income for the manor. As mentioned above, we know there was a mill which once again would have turned a fair penny for the lord’s coffers as all those living within the manor were compelled to have their corn ground here. So, the picture slowly emerges that as with any estate it was a commercial venture that would have been expected to return a healthy profit from its assets. ‘Imparkment could also result in the disruption and even displacement of settlement. At Okehampton the earls of Devon cleared the areas south of their castle of farmsteads and removed the community’s rights to other agricultural resources in order to create a vast and conspicuous greenbelt area around their seat of lordship in the thirteenth century‘. In the end this deer park covered 1,700 acres and once established must have dramatically altered the landscape and people’s perception of it. Which nicely leads on to peoples perception of the castle in more recent times. As described above, from the 16th century the castle fell into decline until eventually it became a ruin. From about the late 1700s it could be argued that Okehampton castle’s role saw something of a resurgence insomuch as it took on a perceived ‘romantic’ perspective. It was at this time that wealthy people went in search of the picturesque which was a phenomenon driven by artists, writers and poets. Suddenly the ruined castle was seen lying in a dramatic and picturesque landscape and visitors came in search of its rugged beauty, as is evident from the wealth of datable graffiti that can be seen adorning the walls today. Below is a small selection of paintings and etchings drawn by artists of this period. It is interesting to see just how much artistic license some of the artists availed themselves of. In particular look at the work shown in image number 4, there you will see a huge river with boats on it which does beg the question, did the artist ever visit the castle? So there you have it, a potted tour of Okehampton Castle and I can thoroughly recommend spending an odd hour exploring. It is not the largest example of a medieval stronghold but it is certainly easy to read. Do buy the guide book as it is a valuable enhancement to your experience and points out many of the easily overlooked features that are dotted around the ruins. Creighton, O. 2002. Castles and Landscapes. London: Equinox Publishing. Endacott, A. 2003. Okehampton Castle. London: English Heritage. Hassell, J. 1807. Beauties of Antiquity. London: W. Day Publishers. Higham, R. A. 1999. Okehampton Castle. London: English Heritage. Morris, J (Gen Ed.) 1985 Domesday Book – Devon (Part I). Chichester: Philimore & Co. Ltd.
Phillpotts, E. 1920 A Westcountry Pilgrimage. London: Leonard Parsons. Young, E. H. 1931 Parochial Histories of Devonshire – Okehampton. Exeter: The Devonshire Association. Endacott, A. 2002. Tales of Old Ockington. Chudleigh; Orchard Publications. Radford, R & A. 2002. The Book of Okehampton. Tiverton: Halsgrove Publications.